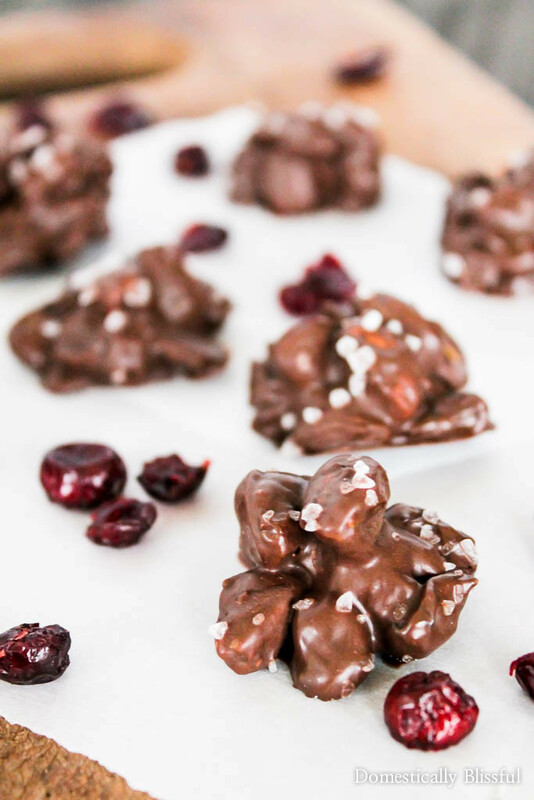 Dark Chocolate Craisins® Nut Clusters with Sea Salt are the perfect guilty pleasure sweet treat that are both healthy & delicious! I don’t know about you, but one of my new year’s resolutions is to eat healthier. A pretty standard new year’s resolution right? The only problem is that I LOVE chocolate! So in order for me to keep my new year’s resolution I had to come up with a way to have my cake & eat it too! 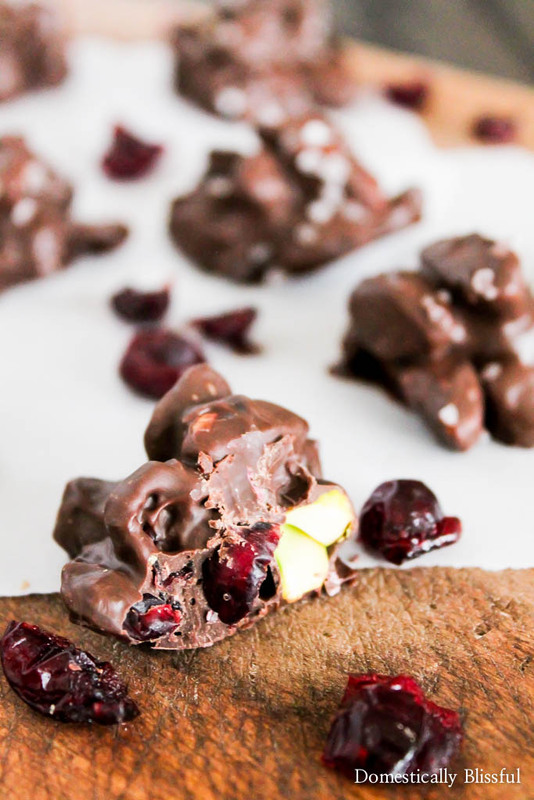 However, these Dark Chocolate Craisins® Nut Clusters with Sea Salt definitely do!! So to make my chocolate cravings a bit more of a healthy addiction, I decided to add something that is crazy yummy, sweet, & already super healthy! Craisins® Dried Cranberries! 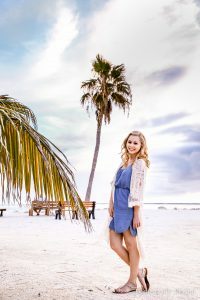 I already add Craisins® to my salads & will sometimes even eat them by the handful for a snack, but adding them to these bite size desserts is now my new favorite way to enjoy them! And did you know that 1/4 cup of Craisins® Dried Cranberries is equivalent to 1/2 cup serving of fruit!? I didn’t, but now I feel even better about indulging in these sweet treats! 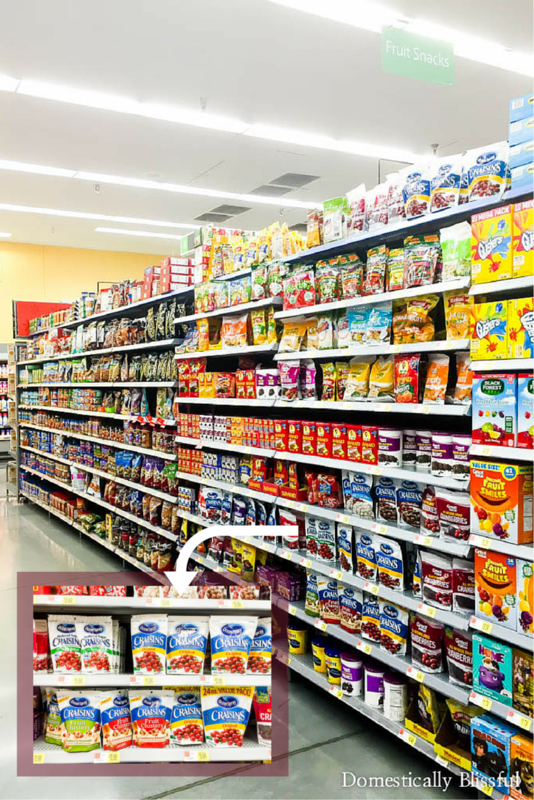 And luckily, since it’s just Roger & I at home, these Craisins® Dried Cranberries come in a variety of packaging sizes (& flavors) which means we can grab a 5 oz pack from Walmart in the dried fruit section & have just the right amount for the 2 of us. And while we were grocery shopping on Friday, restocking our home with yummy food after being gone for 2 weeks on winter break, I also picked up these Cranberry Almond Craisins® Fruit Clusters to try! 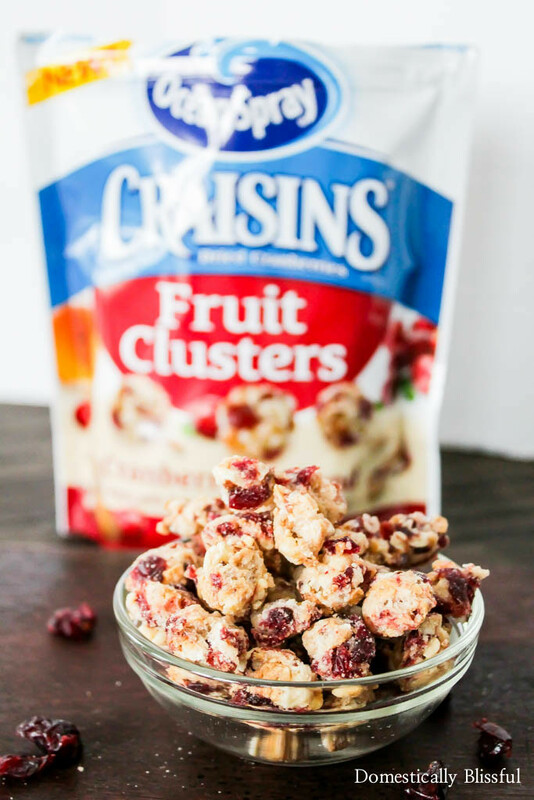 I had already tried the Cranberry Granola Craisins® Fruit Clusters on one of our trips north & love them, so I was super excited to try these too! They are like on-the-go bite size cereal pieces! And they make great snacks for car rides! Yes, I do need snacks for our 2 & 1/2 hour car ride between Birmingham & Chattanooga! 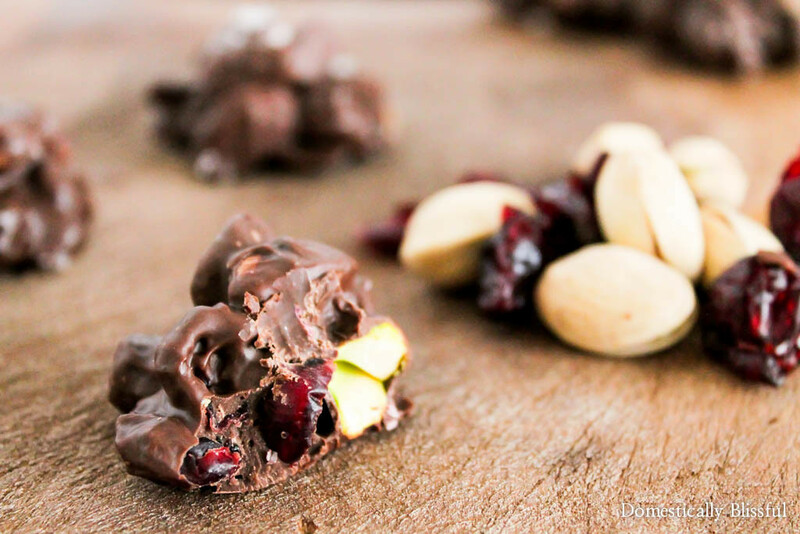 These Dark Chocolate Craisins® Nut Clusters with Sea Salt are crazy delicious & easy to make! Plus you can customize them by adding your favorite nut or assortment of nuts! 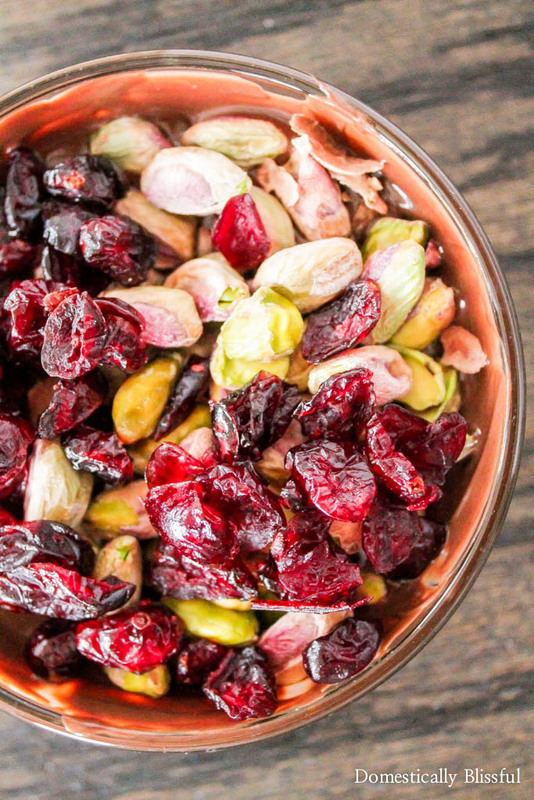 I chose pistachios because they are tasty, healthy, & I love the green & cranberry red colors together! I should also admit that after I took the above picture I was extremely tempted to go snuggle under a blanket & eat the whole thing with a spoon… And I probably would have if Roger hadn’t been home! As you can see my kick for being healthier this year needs some work. But at least I’m trying right!? 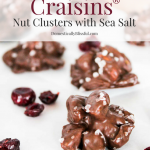 Dark Chocolate Craisins® Nut Clusters with Sea Salt are the perfect guilty pleasure sweet treat that is both healthy & delicious! First, line a baking sheet with parchment paper & set to the side. Melt the dark chocolate melting wafers according to their packaging instructions in a small glass bowl. Spoon 2-3 tablespoons of your chocolate Craisins® on your parchment paper, with a sprinkle of sea salt, & let dry (about 2-3 minutes). *1. The ratio of Craisins® & nuts to chocolate is to your preference. I simply keep adding Craisins® & nuts until their is no excess chocolate. *2. Keep in a sealed container for up to a week. 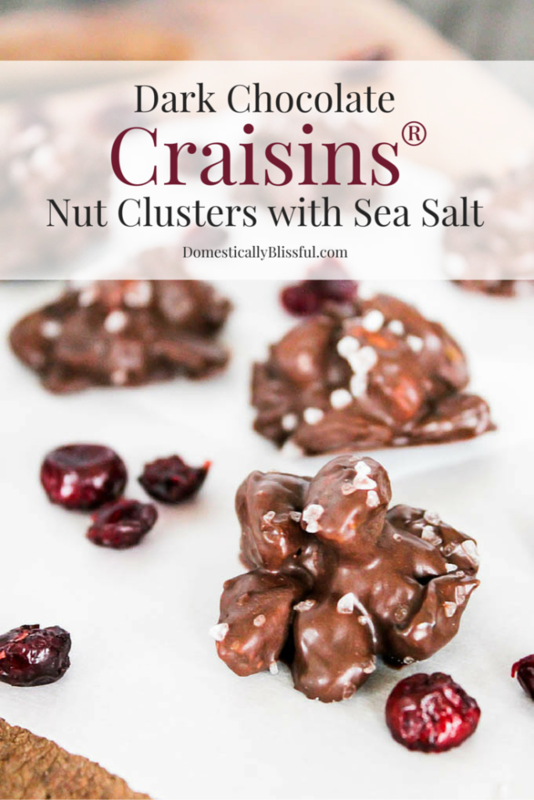 I’d love to see your Dark Chocolate Craisins® Nut Clusters with Sea Salt! 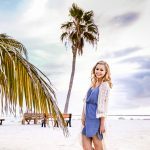 Instagram your Domestically Blissful inspired recipes & DIY projects with the hashtag #DomesticallyBlissful & you might find your picture featured on DB’s Instagram! This post is sponsored by Craisins® through Social Fabric, but the content & opinions expressed here are my own.